Becoming debt-free is an admirable financial goal, but one that is a big struggle for many Americans. Let’s face it: some people who are now starting to get credit card bills from their December spending are also still paying off holiday debt from a year ago. Even if you’re not among those folks, you probably want to eliminate your credit card debt once and for all. To get out of debt in 2013, trying using one – or all – of these six strategies. It would be easy for me to tell you to stop using credit cards altogether. After all, if you’re already deep in a hole, it doesn’t make sense to keep digging yourself deeper into debt. But I recognize that for many people, going cold turkey with the credit cards simply isn’t practical – and may not even be possible. Unfortunately, lots of Americans use their credit cards to help pay for basic necessities – like food or gas for their cars. Nevertheless, if you’re serious about getting out of debt in 2013, you’re going to have to commit to using your credit cards less frequently. My suggestion: make a pledge to use your credit cards strategically and sparingly. To do this, you set specific parameters that are right – and doable – for you. It doesn’t have to be anything fancy or complex. The point is to give yourself a rule, or perhaps a set of rules, to live by when it comes to credit card use. Then you have to stick to the rule(s). You get the idea. Again, your strategy can and should be self-determined and achievable given your current circumstances. But don’t play fast and loose here. Make the parameters a set of guidelines that actually force you to reduce your credit card usage from your current level of credit card spending. This way, you won’t keep adding to your overall debt. So when you do start aggressively paying down your bills, the process of getting out of debt will happen much more quickly. Maybe your debt problem is simply a financial literacy issue. Perhaps no one has ever taught you how to budget, manage monthly cash flow, balance a checkbook or organize your finances. If any of this sounds familiar, you might benefit from the advice of a non-profit credit-counseling agency. Specialists at credit counseling firms typically offer free guidance on the basics of money management. They may also be able to look over your budget, highlight problem areas, and point out mistakes you’re making or ways you can avoid getting deeper into debt. Debt management programs, also known as DMPs, are designed to help you get out of debt faster than you could on your own. Most debt management programs last for three to five years, but the exact amount of time you’ll spend in a DMP depends on your exact debt levels and how much cash you can commit to reducing debt. Here’s the gist of what happens when you enter a debt management program. A) You are required to lay off the credit cards. (In fact, some programs make you close most or all of your credit card accounts). B) Your credit card interest rates are frequently lowered dramatically. (That’s because debt management firms often have pre-negotiated, discounted interest rates with scores of creditors. Rates often run from 0% to 9%). C) Your bills are all consolidated; so you make one payment instead of many. (In addition, you typically pay a small monthly fee to the debt management company for its services). D) Your creditors stop harassing you as long as you keep paying the agreed-upon monthly amount you’ve worked out with the debt management firm. E) Over time, you pay off your credit card bills in full according to a fixed, pre-determined schedule. Unfortunately, many people are too scared to ask for help or they are reluctant to enter a debt management program because they’ve heard about debt relief scams. While there are definitely unscrupulous companies out there, that shouldn’t cause you to suffer in silence and to live unnecessarily with debt. Just do your homework, and check out a company thoroughly before you decide to sign any contracts or enter into any agreements. Banks and credit card issuers love it when you only make minimum payments on your credit cards and loans. That’s because you’ll be paying interest on your debt for many years to come – sometimes for the rest of your life. To get out of debt sooner rather than later, you must break the cycle of only making minimum payments. Instead, try to double or even triple your payments. If that’s not possible, just pay something extra each month. Anything you can afford, and I mean anything – $5, $10, or whatever – is better than just minimum payments, which probably only cover your interest and isn’t doing anything at all to whittle away your debt. Read: How much over the minimum payment should you pay? It may seem counter-intuitive, but while you’re trying to get out of debt, you must also build your savings. Many people ask me: “Which should I do first, pay off debt or save money?” My answer is always: You have to do both simultaneously. Without a savings nest egg, any time you experience even the smallest setback – let’s say, you get a flat tire – you’ll be forced to use your credit cards to cover that expense. And once again, you’re back in the cycle of being trapped with debts you can’t afford. Instead of resorting to using plastic all the time, work little by little to build up an emergency savings account – one that’s truly used only for emergencies; not to go shopping, not for frivolous uses, and not to loan to others. That savings account will help you realize your goal of becoming debt-free. There are lots of debt relief choices available for people weighed down with debt. 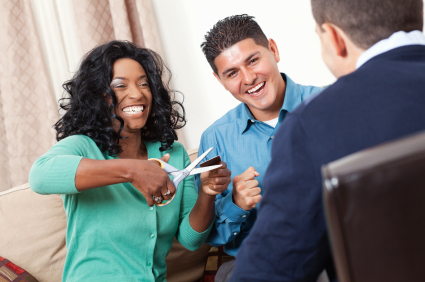 As mentioned, you can try credit counseling or debt management programs. Debt settlement is another option, although I don’t recommend debt settlement for most consumers. Then, of course, there’s bankruptcy as well. If you are overwhelmed with credit card debt, medical bills or other consumer debt that you’ll probably never be able to repay – not even in seven or 10 years or more – you may want to consider speaking to a bankruptcy attorney. Bankruptcy obviously isn’t a step to take lightly. But there are some smart ways to know when to file for bankruptcy or if bankruptcy is a good option for you. Just realize that bankruptcy won’t make all your debts go away. And that’s probably just fine. Because for most people burdened with debt, even just getting rid of credit card bills, personal loans, payday loans or medical debt would be a relief. And that is exactly the kind of debt relief you get with Chapter 7 bankruptcy protection. No matter what your current plight, don’t feel like your situation is hopeless. It really isn’t. And I say this from personal experience. Back in 2001, I had $100,000 in credit card debt and I paid it all off in three years – without ever missing a payment. If I could get out of debt, so can you.